I had very high expectations coming into this book. I LOVED Daughter of the Pirate King, even if that title naming scheme is played out the story inside was amazing. It was the exact amount of pirate adventure, sass, and romance I needed in my life. 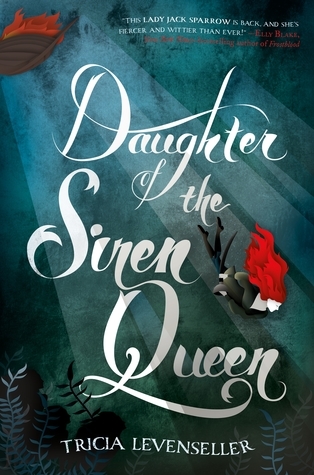 I'm happy to say Daughter of the Siren Queen was good. Was it as great as the first book? I don't think so. But it was still enjoyable, funny, and at times tremendously heartfelt. Alosa was by far the best part of the first book. I expected to immediately love her and be wrapped up in her world. Unfortunately, I wasn't. It took a while for me to get to know Alosa again. The "captured" pirate from the last book was nowhere to be seen in this novel. Alosa was confident and a true captain to her crew. The problem was I didn't know this person, so the choices she was making annoyed and frustrated me, rather than leading me to root for her. This different person also affected the romance between Alosa and Riden. Alosa and Riden are my ship and if they didn't sail I was going to lose my mind!! Their witty banter was another highlight from the first book that got pushed to the side for this sequel. I missed this aspect of the story. It felt like the author kept pushing off the romance so everything could unfold at the last second, it wasn't natural to the story so it detracted from my reading experience. The other problem I had with this sequel was that much of Alosa's crew consisted of one-dimensional characters with nothing but names. Alosa's crew members were dying and it didn't have any emotional resonance because I wasn't familiar with the character. I did enjoy the increased depth of the relationship between Alosa and her father. That is really the driving force behind this story and it added another layer of drama to the worldbuilding. I also, once again, enjoyed the adventure on the high seas! I'm a sucker for pirate stories and honestly, this series is some of the best.